the Chairman of the Board of Commissioners of Currency. 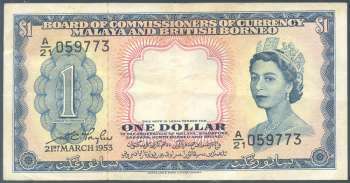 In 1952, Malaya, Brunei, Sarawak and British North Borneo (also known as Sabah) came to an agreement that the Board of Commissioners of Currency be the authority to issue the unified currency for Malaya and British Borneo. When the agreement became effective, the Board of Commissioners of Currency, Malaya was renamed as the Board of Commissioners of Currency, Malaya and British Borneo. The Currency Ordinance No. 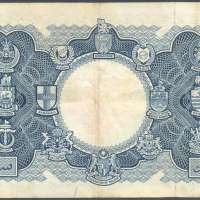 44 of 1952 of the Crown Colony of Singapore, No. 33 of 1951 of the Federation of Malaya, No. 10 of 1951 of the British North Borneo and No. 1 of 1951 of the Crown Colony of Sarawak implemented an agreement between those governments and the State of Brunei for the establishment of a Board of Commissioners of Currency to be the sole issuing authority in Malaya and British Borneo. 6. and two further appointed by agreement of the participating governments. The Malayan dollar was replaced with the Malaya and British Borneo dollar in 1953 which began issuing 1, 5, 10, 50, 100, 1,000 and 10,000 dollar notes. The 1 and 10 dollar notes were again issued in 1959 and 1961 respectively.